The most craved item on a low carb diet is usually bread or pasta. So to get right to the point of this page: If you are struck with the irresistible urge to splurge on the forbidden bread or pasta then do so with a low carb variety. This will ensure that you don't fall completely off the wagon and will prevent you from getting too far from ketosis. In an effort to help you stock your shelves and fridges wisely I have created links to the best possible low carb pastas and breads. Click the Product Name or Image for more details. 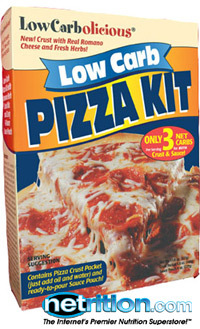 Use this handy product search box to save money on low carb foods including Pizza, Pastas and more! Netrition has the best selection of Low Carb Foods and Supplements at the absolute lowest prices anywhere. Shop around all you want and you'll see it's true. When I want to save money this is where I shop. Unlike "low carb" pastas that contain mostly soy protein and fillers, Dreamfields is authentic pasta made with premium durum wheat semolina. 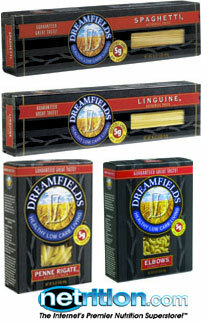 Our unique pasta recipe means fewer carbohydrates get absorbed into your system, much like whole grains, so Dreamfields is a delicious way to enjoy healthy carb living. Bella Vita is made from succulent, vine-ripened sweet plum tomatoes, and is simmered in extra virgin olive oil. 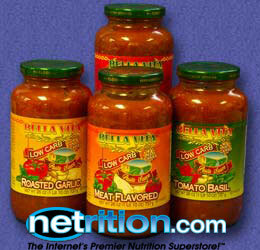 Bella Vita sauces have only 4g net carbs per serving, are cholesterol free and are OU Kosher Pareve. Now you can enjoy healthy, all natural, low carb pasta dishes with plenty of pleasure...and none of the guilt! Now that's a beautiful life! These sauces are perfect for the health-conscious and health-concerned consumer. Made from hundreds of fresh ground herbs and spices, natural flavors, fine imported vinegars and other natural ingredients. The only zero calorie, zero sugar, zero carb, zero fat, and zero gluten pasta sauces available. 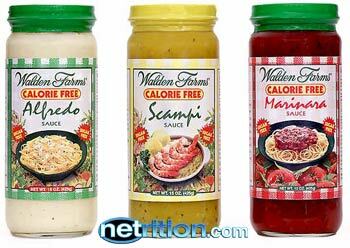 Walden Farms Calorie Free specialties are endorsed by the American Diabetes Association. This Pizza Kit, packaged in shipping-friendly, tear-open pouches, makes one perfect 12" pizza. Just mix the contents of the crust pouch with water and melted butter, spread dough onto pizza pan (a 12" micro-perforated, thin crust pan is recommended for ideal crispness) and prebake it for 10 minutes. Then pour on the thick, zippy sauce; followed with your favorite protein-packed pizza toppings (such as sausage, pepperoni, ground beef, bacon, Canadian bacon, chicken) and veggies (green pepper, onion, mushrooms, garlic) and, of course, lots of cheese! Pop back in the oven for 7-10 minutes, then ENJOY while still being true to your diet! The Crust provides a whopping 68 grams of protein, with just 24 net carbs per entire 12" pizza (typical pizza contains about 30 carbs per SLICE!). Bakes up crisp and golden brown, perfect every time. The Sauce is Sugar and aspartame-free, bursting with rich tomato flavor and classic pizza spices - oregano, basil, garlic, onion, red and green bell peppers, and a dash of crushed red pepper for added zip. The generous 6 oz. sauce pouch has only 6 net carbs per ENTIRE pizza! This product is kept frozen in the warehouse until the day they ship. Shelf life is approximately 6 weeks at room temperature, and up to 6 months frozen. We strongly recommend refrigerating or freezing them upon receipt. Available in Original, Parmesan Oregano and Garlic Basil Flavors. 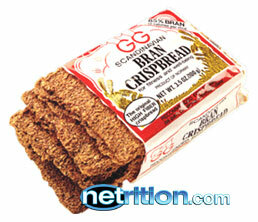 GG Bran Crispbread is a traditionally baked crispbread, which is still produced in Norway, by the Gundersen family. Founded in 1935, Mr. Eugen Gundersen, who created the original recipe, began producing bran crispbread as he found that the original Scandinavian crispbread was the most effective and appetizing method of supplementing his diet with fiber. Highly recommended by leading physicians and nutritionists for diet control especially for diabetic and cancer patients and anyone who is looking to lose weight. Made with 85% unprocessed bran, it's the highest in dietary fiber and lowest in calories with only 16 per slice. 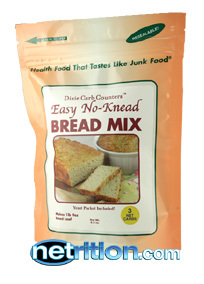 Delicious with any topping and can be used in place of regular bread in sandwiches or snacks. Try with low-fat cheese, peanut butter or any other spread. Zero Net Carbs per serving! Mama Lupe's Low-Carb Tortillas are delicious. Unlike other low-carb tortillas, Mama Lupe's taste just like regular restaurant tortillas. 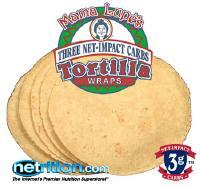 Use Mama Lupe's Low-Carb Tortillas to make a low-carb snack or meal. Make a breakfast burrito or replace bread in your favorite sandwich. However you use Mama Lupe's Low-Carb Tortillas, you are sure to enjoy them. Packaged in a resealable bag: 10 tortillas, net weight 12.5 oz (360g). Toufayan Wraps are the easy-to-use wraps for everything from overstuffed deli sandwiches to traditional homemade lunches. Thin, pliable and delicious, Toufayan Wraps are baked in a unique way to hold their shape - no matter what's inside. 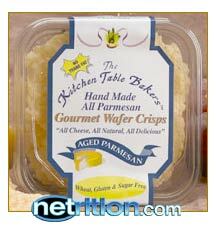 Easy to use, they're packaged in a specially designed re-sealable package to maintain freshness. 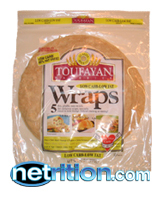 Toufayan Wraps are the nutritious low carb, low fat alternative to ordinary bread. 8 grams of fiber and only 7 net carbs per large wrap! Since 1926, the Toufayan family has been bringing to its customers the finest in baked goods. Our old world recipes using top quality, wholesome ingredients, naturally cholesterol free, were brought to the United States in the 1960's. Then, in the original pita tradition, we hearth-bake each bread to a perfect golden brown. Toufayan Pitas are convenient and versatile. Just cut in half or at the top and fill with meats, salads, or cheese. Great for tacos, sloppy joes and fajitas. Or cut into bite sizes for appetizers. 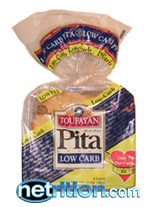 9 grams of fiber and only 7 net carbs per full pita loaf! Great Taste! 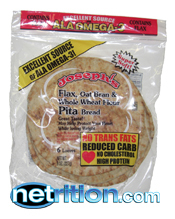 Joseph's provides you with a healthy, reduced carb, high protein Pita bread containing Flax, an excellent source of Omega-3! These Pitas have no cholesterol and contain three healthy ingredients: Flax, Oat Bran and Whole Wheat, which may help protect your heart, while losing weight. 4 Grams of Fiber and Only 4 Net Carbs! 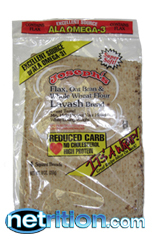 Joseph's provides you with a healthy, reduced carb, high protein Lavash bread, now containing flax! These Lavash have no cholesterol and contain three healthy ingredients: Flax, Oat Bran and Whole Wheat which may help protect your heart, while losing weight. Each serving of this Lavash (half of each large bread), contains 3 grams of fiber and just 4 net carbs! These breads are kept frozen in our Netrition warehouse until the day they ship. Shelf life is 2 to 3 weeks at room temperature, up to 8 weeks refrigerated or up to 6 months frozen. Now you don't have to give up mashed potatoes if you are watching your carbs for weight or sugar restriction. Delicious "instant mashers" stirs up 4 servings. Just add butter and cream and enjoy. Be sure to check out all the flavors. Each pouch contains two 4 serving inner packs. Just 4 net carbs! The finest soybeans organically grown and expertly cooked at Eden's certified organic, kosher cannery. A versatile medium large, round, deliciously sweet bean. Especially heart healthy, rich in fiber, soy protein and isoflavone nutrients. No salt added. The only low carb bean. - Just 1 Net Carb per serving! EDEN Black Soybeans are organically grown in nutrient rich vital soil on family farms committed to a clean environment and the most nutritious, life encouraging food. The beans are soaked overnight and cooked with a bit of kombu sea vegetable that softens and brings out their flavor. No salt added. Enjoy the wonderful flavor of fragrant homemade yeast bread. And at just 3 net carbs you can enjoy bread, toast or sandwiches anytime. Mix is so easy to make, just place eggs, cottage cheese, butter and water in bowl, stir, add dry mix and yeast and place in oven to rise for 45 minutes. Bake for 45 minutes and enjoy! Makes wonderful toast also. Freeze or refrigerate leftovers. No preservatives - all natural. Bread machine directions also included on label. Now you can enjoy wholesome bread baked fresh from the oven without all the carbs. With our special blend of all natural ingredients, including high fiber oat bran, wheat bran, soy flour and whole grain flaxseed meal, you can be sure that the few carbs you do eat are nutritious. 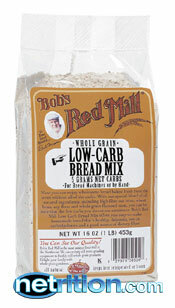 Bob's Red Mill offers you easy-to-make homemade bread that's healthy, delicious, low in carbohydrate and a good source of dietary fiber. The material posted here on Low Carb for Life should NOT be considered medical advice and is NOT intended to replace consultation with a qualified medical professional. Please consult a medical doctor before making any changes to your diet or medications.